The advertisment says “This is without doubt the most efficient and practical all round carryall ever designed.” A bold statement and, for an old cynic like me, one that I was prepared to take with a pinch of salt. But, on receiving the TF Gear Carryall I was immediately impressed by the build quality with its rugged zips and strap connectors, they certainly look like they will give years of good service. The bag is made of a waterproof material, again a big plus for the roaming angler who may not take a brolly with him, and the carry straps are well padded. Looking inside I have found the main pocket to be capacious enough for all of my needs including room for my flask, something that many smaller bags don’t allow. There is even a plastic pocket in the lid for your licences etc. The side pockets are just right for a camera, scales and anything else you may want to find quickly and there are net pockets outside of them that will take a tin of drink or your phone. The large front pocket opens to reveal the free TFG Lokbox which is a real bonus and will come in very useful. Mine is now full of lures. This carryall is exactly what I’ve been looking for, larger than most of the bait bags I’ve looked at yet small enough to be comfortably carried all day. Is it the “most efficient and practical all round carryall ever designed?” Well, I have yet to find one better so I cannot argue with the statement and at a price of just £29.99 why look any further? Thanks to Dave Burr for this Review. Started off from sunny Cornwall. The A30 was clear, foot to the floor – as I hit Bristol the heavens opened and down came the rain. As the traffic slowed down to 40 miles an hour, there was a slow drive ahead of me towards the M4. The pace picked up, I turned off juntion15 edging towards Lansdale and after a while I turned up at the Carp Society’s Horse Shoe Lake. I was greeted by David, one of the Managers at the lake. We started to chat about what had been coming out that week and he advised me to look at Winters Bay as some fish were holding up in there. As I slowly drove around the lake, winter bay was looking the best option for me as there was nobody in there. I finally opted for peg 20, this was a double swim with a fair amount of water to go at. I started to set up and once again down came the rain; it must have followed me from the M5! Up went the bivvy and out went two kilo of Smokey fish Boilies all over my swim with the throwing sick, closely followed by two rods loaded up with PVA bags into the edge of the weeds. Within two hours of waiting off went my first rod, a good 10 minute fight and my first Horse Shoe carp on the bank. I have heard that these carp are one of the best looking strains of fish in the country, and I wasn’t disappointed when faced with a lovely scaled mirror on the bank. Later that day I was feeding fish from under my rod tips with crumbed up Smokey fish boilies; these fish weren’t shy, they would have stayed there all afternoon eating all the bait I put in front of them. This was good time to test out my new camo rig, as can be seen it’s camouflaged with a gravel affect but all the straight lines still stand out; as Shaun Harrison once said to me there are no straight lines in nature. So the next stage on my quest for the ultimate camouflaged rig is to disguise the lines even further. But as far as Horse Shoe Lake goes, you’re not allowed to use any leaders of any kind and can only use tubing, so this is the best camo I’m probably going to get at the moment. As the sun went down and the moon came out I sat down and watched the water in the moon light over a glass of red wine, Horse Shoe is a very peaceful and tranquil place to fish, next month I plan to return for some more action! I arrived at the gates of Les Noyer around 9.45am on Saturday following a two & half hour drive from Roscoff, and after a short wait for the bailiff to let us in we pulled up outside a large house overlooking a small lake. Talking to bailiff she told us about the previous couple of months fishing and informed me that the previous months fishing had been fairly quiet. As we started to unload the van and looked at the water I decided to have a walk around the lake so I could get my bearings and start to build a plan of action for my fishing. After a good stroll around the lake I decided to set up on the second bay and fish to the far side of the lake, to the outlet which was the deepest part of the lake. I cast my line onto the other bank and placed my bait onto my hair then slowly lowered my rig in to my chosen area, scattering 60 freebies around the area. At about 4.30pm, a single bleep from the bite alarm stopped me and I looked round just in time to see the middle one of my fishing rods roar off. After a ten minute battle I slipped the net under a lovely looking 21lb mirror, and I wondered if this might be a taste of what might be to come, by the late afternoon the temperature had hit around 12 degrees and the rain had started, I still had to put my other rods out. I had a good play around with a marker float and soon had the lake mapped out. My second rod was going towards a small bar which was straight in the middle of the lake. I casted out a small pva bag fill 15mm fruity boilies and pellets onto the bar and scattered 100 boilies around the area, after setting up my third rod I saw a fish top in the bay to the left of me, I walked my rod round and placed my rig close to the edge with about 10 crushed boilies scattered around it. I was awoken the next morning by a 2 bleeps from the bite alarm on my right hand rod, after a few minutes watching my rod nothing happened. Later that day set up my sons 6ft rod and set him up in the stock lake with a float and fresh maggots, within 1 minute of casting out he was into a fish; a small roach, and then every cast he was in again, that was a good days sport while I was waiting for some action of my own. The sun was soon setting in the background and the temp slowly dropped, it was time to get a good warm meal in me, which got delivered to my peg, beef wild mushrooms white asparagus fresh truffles with a nice glass of red wine from the local area, I’m glad I had my own chef with me for this week. There was no action through the night, so it was time to recast and start again. Still no fish so we decided to wind in the rods and have a day out, we headed to La Mans which is about one and a half hours away, we walked around the old part of the town and got a few bits of fancy food for the next couple of days, then a drive to La Mans race track for the rest of the day. It was good to get out and see France and clear my mind of fishing, we headed back and I soon was planning my new plan of attack. I changed all my rigs to a combi set up with small pva bags out they went in three new areas of the lake, now it was waiting time to see what would happen. The next morning my right had rod screamed off and as I hit it I soon saw it was not a fish but a carpal that had taken my bait up on the bank (at least my alarms work). Friday soon came I was now under pressure to catch another fish before I left, later that day I was sitting out enjoying the sun and a spot of lunch when my margin rod screamed off, I shot over like a rocket as I hit into a good fish, I played it slowly trying to wear it out, after a short battle the net slipped under the fish and in the net she was, a last a nice looking mirror well worth the wait. Then after a few photo shots back she went, the pressure was off now I can back and finish of my lunch, lobster salad it’s a hard life! Saturday morning was soon here and time to pack the coarse fishing tackle away as I loaded up the van and sat on the wall with a nice cup of tea looking out on the lake, this was a very peaceful place. Maybe the summer months might produce more fish? But I still had two nice mirrors and a good day out in Le Mans. The Compact range, designed and tested by yours truly are, I reckon, the best fishing rods to come out for a long time. The rods retain all the power and attributes of regular rods in but in shorter lengths. And those of you who have tried using short rods will know that you get much more power and leverage. When I go fishing, I like to be as mobile as possible, and these rods are so easy to carry that you forget that you have them in your hand sometimes. Indeed, touch legering with the eight or ten foot Compact feeder is effortless – you can sit there all day without the tip wobbling around. The Compact Range includes 10′ Carp, 10′ Feeder, 8′ Feeder and a 10′ Specimen Float. All are real pocket battleships with killer actions. 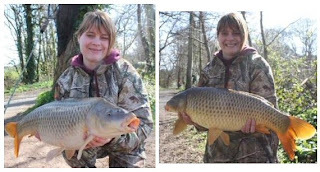 I recently used the 10′ float at Himley Hall in Dudley where I caught carp of 10, 14, 16, 22, 24, 25 and 30 pounds without one snap-off or lost fish. Incidentally, I also landed grass carp to twenty six pounds too! The ten foot float is also a great floater rod for commercials and a nice alternative to an avon for barbel and chub on small rivers. The carp rods are perfect for small to medium carp waters, and perfect for anglers who don’t want to carry a heavy armoury of carp kit. At two and half pounds test curve, they are perfect for general carp fishing and also make great stalking and floater rods for big fish. I would use them without hesitation on all commercial-style waters where long range casting is not required. Having said this, the rods will cast over eighty meters in the right hands. A big bonus is that they make cracking pike boat rods! Perhaps the star of the show, though, is the 8′ feeder. This is a cracking little rod and a real pocket battleship. It too has already landed carp into the mid-twenties without breaking sweat. I can’t wait to use this rod for some touch legering for barbel and chub this winter. I used the prototype last year and it was awesome! The best part is that all the fishing rods come in at decent money. They are top quality but because they are shorter we use less carbon, hence a lower price! I recently spent a day at a lovely water near Exeter called Creedy Lakes, which is owned and run by Sandra & Stewart Tuner. Set in peaceful, picturesque surroundings, these two 18th century spring-fed waters offer some of the hardest fighting carp in Devon. Abundantly stocked with immaculate commons to over 31lbs, mirror and koi carp, together with green and golden tench, making it one of the best big fish day ticket water venues in the Southwest. The main lake is about 4 acres and holds a good head of carp up to 31lb. On this session I was more than pleased with all 3 fish over the 20lb mark, but the one I won’t forget is the bigger one of them. I knew as soon as my TSI rod had screamed with this fish and I had hooked into it that is was unlike any of the others I had played that day. It played me hard, much more so than the 21lb I had landed that morning. It used its weight to try and hold up in the water and I had no option but to let it play me and take more line off my vanquish reel when needed. After what seemed like a long tense struggle with the fish it was finally by the net but was still not going to give up that easily and was still fighting hard. With a final struggle the fish was in the bottom of the net and already I knew that I had a fair sized carp in there. When I put it on the unhooking mat it became apparent that this fish was not only pretty long but also pretty wide and weighed in at 27lb 3oz. What a cracker of a fish it was and I couldn’t wait to have my photograph taken with it. I was proud to be able to put this fish back into the lake ready for someone else to catch another day. I know that I can’t expect action like this every time I visit a day ticket water but it is a good feeling when it does happen. I will never underestimate, and neither should anybody else, the success that can be achieved from a day ticket water. When I was a kid (and yes, I know what you’re thinking but it wasn’t that long ago!) it was generally accepted that the barbel hibernated in the winter. The standard practise was to fish for barbel in the summer and autumn and then hang the fishing rods up until the following June. Eventually, the thinking changed and we began to realise that not only are barbel a good target in the winter, they are also in their best condition. I think it was fishing on the Severn that persuaded people: a few late autumn matches were won with ‘bonus’ barbel caught by legering a big lump of meat down the edge in a flood. Pretty soon anglers started adopting the same tactic in the winter and hey presto we were suddenlty all year round barbel anglers…. Living as I do near the river I often get the chance to play around with barbel baits and tactics. Many years ago I got a new rod for christmas and I was desperate to try it out so, while my mom was stuffing turkey and the rest of the world was opening presents, I snuck off up the river and nailed my one and only christmas day whisker in less than an hour on a big lump of meat. When you know a river really well such things are possible and so too are endless possibilities to try out new baits and ideas. It was on the Severn, for instance, that I invented the new infamous ‘time bomb’ method using an open ended feeder stuffed with pellet groundbait and boilies/pellets – an approach that has changed the way anglers fish the river irrevocably. The middle Severn was also the place where I played around with boilies when formulating the amino active CSL boilie that is now a flagship product in the TF-Gear range. Amino Active CSL is basically a commercial version of a home-made boilie I had been using for a number of years to catch barbel. Amino active is one of those rare baits that not only works the first time you use it but carries on getting better the more of it you put in over a period of time. That’s because the base mix (food value) of the boilie is naturally strong whilst the flavour label (an essential oil) is very subtle. It’s my experience with barbel (and other species, actually) that baits heavily laced with flavour never catch fish for very long. 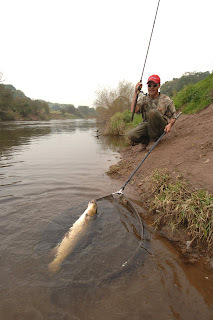 People often ask me how to fish the river barbel given the success of pellets. ‘Have the pellets blown?’ they ask. The answer is yes and no. On the heavily fished stretches of river you can forget about using great big halibut pellets on the hook – the barbel have wised up to them. A few small pellets in the feeder or bag (3-4mm) jobs will help to attract the fish but keep the free pellets at a low level and instead stuff the feeder with a mixture of mini pellets, Crunchy Fish groundbait and broken amino active CSL boilie with the edge nicked off (this releases the subtle aroma that barbel will home in on). Using this combination I feel confident of catching barbel anywhere on stretches of river ranging from easy to difficult. Of course, no bait will work unless you use it in the right swim and in the right conditions. In winter, the conditions that you are looking for are rising or stable water temperatures with the river temperature at four degrees or more. Don’t worry about the colour – I’ve caught barbel in rivers so dirty that visibality is reduced to just a few centimeters. Quite how the barbel manage to sniff the bait out in chocolate coloured water amazes me sometimes but they do. When winter pays a visit to the lake I’m fishing, the water almost overnight becomes as clear as glass making me pay some thought to the line on my spools. When choosing line I soon came to realise you have to have a good look around as there are so many to choose from. I’ve been using Xline for some time now and I wanted a change so I decided to look at red mist line from TF Gear. After a fair amount of research on the product and discovering that red is the first tone to disappear in the colour spectrum, making red mist almost invisible in water, I was more interested in giving it a chance and ordered my sample. When it turned up I was very impressed, a nice smooth silky feel to the line and a good knot hold I soon poured hot water into a bucket and dropped the spool of line in there for 10 minutes, getting rid of any memory in the line. Red may not be the first of choices for a ‘serious’ carp angler and definitely goes against the norm but slowly it is tempting more and more of us into giving it a chance and why not? After being convinced to put my fishing waders on and half freeze to death, during a recent winter session, and stand in the lake for that prize picture I was intrigued as to what kind of temperature the water itself was. This gave me the idea of pinching the ray temp gun out of my husband’s kitchen and having a built in laser it has proven to be extremely accurate in the lake each time I go fishing and more importantly each time I have landed a fish. This is beginning to help me build up a good picture of the year to come and hopefully in time to come help determine the ideal water temperature to catch. I’m sure each lake has its own characteristics and differing reactions to differing water temperatures but never the less spending short periods of time researching a water could pay off greatly in the long run.